Authors: CLEMET, Charles R.; ARKCOLL, David B. 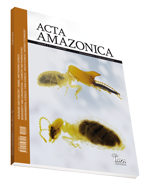 Authors: NELSON, Bruce; PRANCE, Ghillean T.
Authors: GIUGLIANO, Rodolfo; SHRIMPTON, Roger; MARINHO, Helyde A; GIUGLIANO, Loreny G.
Authors: DIAS, Silvia M.C; MAIA, J.C.S. ; FERREIRA, Zeneide S.; GOTTLIEB, O.R. Authors: SILVA, José Jerônimo da;GIESBRECHT, Austréa M.; ALVARENGA, Marden A de; GOTTLIEB, Otto R.
Authors: PENNY, Norman D.; ARIAS, Jorge R.
Authors: ZIMMERMAN, Barbara L.; BOGART, Jaime P.